See the photo below of an extremely happy Steve Rudge. This is a great opportunity for you to try your type evaluation skills. See if you can find the differences from EVV. It looks as if our CFI will be out of action for at least 3 months so until further notice all CFI matters are to be addressed to Simon. We all wish Steve a rapid recovery. The members evening was extremely well attended. So much so in fact that next time we will have to get a public address system. We were lucky to get the main part of the meeting done by the time the electricity went off! The kitchen did a fantastic job and laid on a candlelit dinner. Simon Towers the treasurer gave a very clear explanation of the finances, Sarah Platt showed what we are doing re the marketing and Simon Adlard stepped in for Steve Male and presented the current strategy and questions relating to the fleet. The purpose of the meeting was to improve the communications to and between the members and help the committee on the members desires for the future. Please email me if you can offer any improvements to the content or format. One of the points to come out of the meeting was that we want as many “plastic” gliders as possible at the launch point available for solo flying. To help deliver that we are now using the Twin Astir as a solo machine for those who have been briefed on flying it. To quote one happy customer “I will happily fly it solo on the grounds of comfort and general performance.”. On the Sunday it flew more than any of the single seaters. Len Dents Funeral will take place on Tuesday the 5th of December at 12 Noon. It will be at Birtley crematorium, Windsor road, Birtley Chester Le Street DH3 1PQ. Tel no 0191 410 2381. As you can see on the website we have a problem with the imaging and information overlays of the webcams. Our webcam IT team are working to resolve this. The electric supply to the North Rail is complete. Call the office if you wish for a connection. As part of our campaign to increase membership and sell trial lessons as Christmas presents, we have taken a stand at Shrewsbury Winter Festival on the 9th & 10th of December. If you can help with any of the following, please let Sarah know asap by emailing her at marketing@midlandgliding.club or calling 07754 070357. During the show itself (the show is open 10am-6pm on Sat, and 10am-5pm on Sunday HOWEVER we are only asking people to do a morning or an afternoon slot). Denise has worked out a superb schedule for this winter’s lectures. They all start at 18:00 and if we have a speaker then we do ask for a small donation on the night to cover their expenses. Book the date, have a few flights, enjoy the talk then have a superb evening meal. We have the opportunity to go to Llanbedr next year for the week commencing 10th March 2018, with the prices the same as last year, £20 per aircraft and £12 per person per day. This is a huge airfield with massive runways and access to Snowdon and the Welsh mountains, but it is quite expensive, we have to pay a one off fee in advance and there is no refund if the weather is bad. The alternative is to go to Lleweni Park in Denbigh. This has a single narrow runway, it costs a £40 deposit plus £17 per day that you are there, and has a Skylaunch winch and a huge ridge and is a good wave site. We would probably also have access to a tug. It is more difficult to fly from, more difficult to get into Snowdonia but cheaper. Please email mail@mikegreenwood.co.uk if you want to go on the expedition, and your preference of where to go. If not enough people want to go to Llanbedr we will go to Lleweni Park. Your Chair and Roger Andrews spent a day at the CAA in Gatwick with the end result of a full set of paperwork so she is ready to go. Lets hope we get as much wonderful flying out of her as we did EVV. Unfortunately our CFI is going to be indisposed for an unknown period. Simon Adlard has very kindly agreed to be the interim CFI so please address all CFI related issues to him. Many members will have fond memories of Len. He was dedicated to the Club and flying at the Mynd. He had an encyclopedic knowledge of the history of the RAF and aircraft types from the earliest to the modern. He recently saw the Battle of Britain film and found a number of technical flaws in the aircraft used in the film. Show him an elevator or an engine part and he would identify where it belonged within seconds. As they often say in cases like this, he will be missed, and it is true. Len joined the Club in the early 1970s, when he worked for Bulmers Cider in Hereford after a career in the RAF. He was a full category instructor for over 25 years, Club secretary and DCFI when he assisted running the courses one season with Jack Minshall. He then moved to Loughton to teach having gained a degree from Sunderland. He owned a share in a number of gliders including the PIK20D 688 and used to share the journey up from Loughton with the late Roland Bailey to fly at weekends. Len sold his share in the PIK when he moved to live in Gateshead following his retirement. 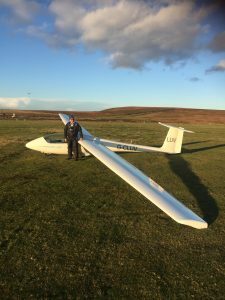 He then joined the Northumbria Gliding Club and purchased a share in a K7 along with two other pensioners, whose combined age even then was over 200. 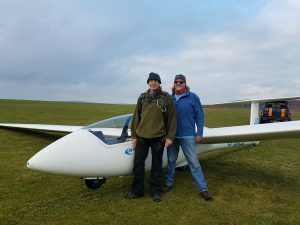 After a few years they took the K7 to Milfield to fly at the Borders Gliding Club and this led to annual Mynd expeditions to fly there, which still continue to be made. Len also purchased a share in a Sport Vega, which he sold a couple of years ago, and he was flying Club gliders until a few weeks ago. In between this extensive gliding activity, Len made a number of trips to glide at Minden in Nevada with Roland and to France at Chauvigny with the PIK syndicate. We are looking for good quality in-flight videos to use on our social media pages and website (with your permission) Can be 10seconds or 10mins, doesn’t matter. 20-30seconds is ideal. Also if you take any good quality photos around the club that you’re willing to share, we’d be really grateful. It could be airborne, at the launch point, around the hangar or even inside the clubhouse. We want to showcase the club and need loads of images and videos to do so. 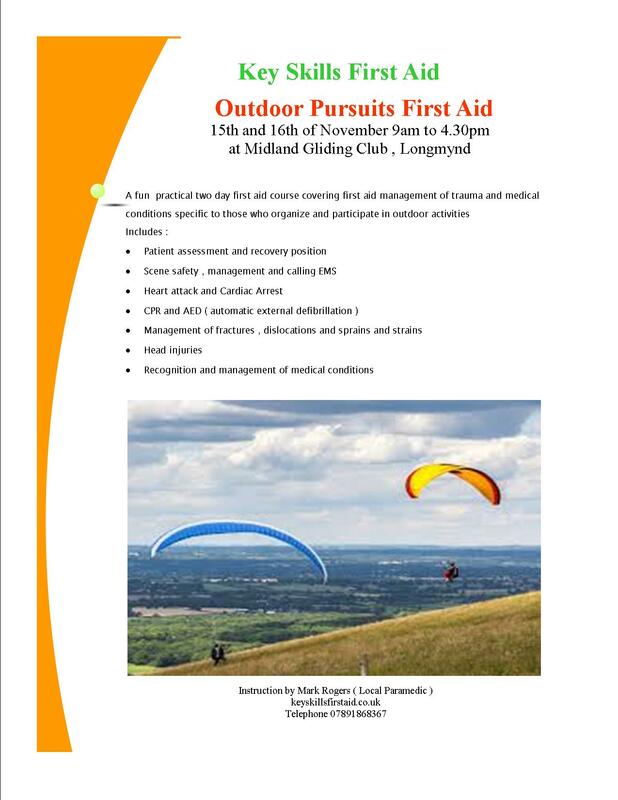 You can send your images to marketing@midlandgliding.club or email me for a Dropbox link to upload them to. By submitting them you give MGC permission to use the content for marketing purposes (credited to you wherever possible). I would also like to get some printed up onto canvases around the clubhouse to brighten it up and give it a fresh look. We may also use them for a 2019 calendar. Look forward to seeing your submissions and thank you in advance! The South trailer park has been re wired and we will be expanding the electricity for de humidifiers to the North trailer park. I will provide more information once the kit is installed. Can I suggest you bring your prizes along to the members evening. November 25 will be the members evening when the committee will present our strategy for the next 5 years and invite your input and approval. We will present the strategy, the critical issues then a short presentation on the finances, the marketing and membership followed by the fleet. Please be aware there will be audience participation! I am expecting quite a lot of members to turn out so I suggest you call the kitchen on Friday and let them know you will be wanting to eat on the Saturday. The south rail electrics have been uprated and now are fully weatherproof and have two spare outlets. One of you is not yet connected as you have used 4 core three phase cable and I need to know how you have wired your socket! Let me know who you are and I will check your plug and connect you. We need a team to help dig a short trench so that we can install a power supply to the North hitch rail. I need to know how many of you are interested a power supply to your trailer. The cost of the cable will be approx £100 divided amongst all that use it. If you haven’t bought into Mac and Steven’s 4 way hookup you will need to pay your share of a box, plus consumer unit, plus meter. This will be approx £160. The only other expense then is a RCBO £15 ,1.5mm three core hituf cable to reach your trailer 80p/meter and the socket and plug at the trailer. So an initial outlay of £260 for the power supply and distribution board plus approx £40 to get to your trailer. So first let me know if you are interested, then let me know if you have a strong back and can help dig, we can then put a duct in. You will be glad to know the duct is free! Hi everyone, this is the regular Thursday posting to let you know what is coming up in the near future and the highlights from the last committee meeting. 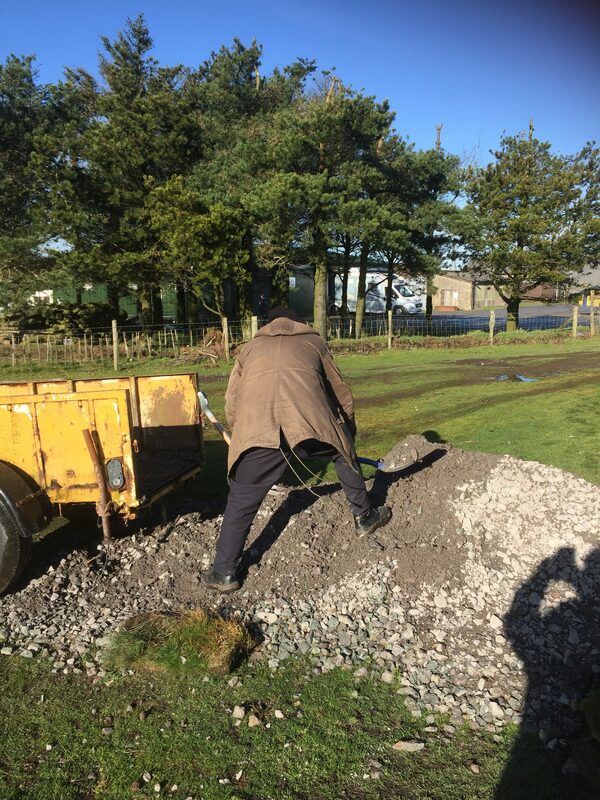 This week, with help from Charles Carter who drove the excavator, we were able to do some more work which will further improve the drainage from the road. We will continue to monitor the condition of the road over the coming weeks and will arrange more repair sessions as and when they are needed. Watch this space for future dates. Sarah did a very well received marketing presentation, this is of major interest to all the clubs and we are leading the pack in some areas. The conference was extremely well attended and provided a wealth of ideas to help us. We received an update from the business rates team who are working tirelessly on our behalf. Just a reminder the funding runs out in December so if you were wondering whether to claim then you need to act quickly. Saturday: Mark Sanders, Peter Orchard, Dave Cole (we may need a substitute). Poz is coming! It is his birthday party this weekend so fingers crossed for good weather for him. The conference was quite explicit that the delay to EASA implementation was to ensure that administration was in place and there is no evidence that the conversion will not take place. The BGA Safe Aerotowing webpage has been updated to reinforce the need to avoid distraction, and to highlight potential handling problems on tow. We’d be grateful if you would highlight the updated information among your club pilots. November 25 will be the members evening when the committee will present our strategy for the next 5 years and invite your input and approval. We will present the strategy, the critical issues then a short presentation on the finances, the marketing and membership followed by the fleet. Please be aware there will be audience participation! Price adjustments (except courses and accommodation) will be discussed at the December meeting after the members meeting. Fleet. LUV is waiting the CAA to tell us how to fast track the registration, EVV we are awaiting the insurance, Discus will be opened up for sale generally. Health and safety. Continual progress is being made on the items, the priority items will be monitored by a separate meeting. CFI report. There will be a safety review on the 2nd of December with the regional examiner. Finance. the cashflow will be presented at the members meeting. The business rates will be discussed at the BGA conference by the Chair and Roger Bagley of the BGA rating team. We still only have 2 signatories for the bank account, getting 3 signatories is now a very significant priority for the club. We are doing tests on one of the main winches to find out what is causing the smoke. GDPR: John O’Reilly will be producing a set of milestones. Well there was wave, two of us motored in, you could say it was cheating and you may have a point!. However after putting the time in and still not connected properly at 4500′ QNH I thought that seeing as I was going to fire the engine at some point during the flight anyway I may as well fire up now and use it to get into the wave. I only needed to gain 800′ feet and move forward a little and there I was. Climbing to 12000′ as I didn’t have oxygen with varying rates of climb, typically 2-3 knts and occasionally 4-5knts. Traveling upwind was a challenge with 55knts headwind slowing down to climb would easily see me flying backwards!. Eventually I got to Vyrnwy when things changed, a normal looking jump to the next bar left me in amongst the cloud in a hole that wasn’t working!!!. dropping out of wave over the middle of wales was not part of the plan! Never mind all character building stuff so I had to fly home under the cloud with plenty of fall back plans that I fortunately didn’t needs. The only pure pilot was Mark Sanders in 445 (KA also tested its motor) He managed his gold height and now has a completed gold badge. The wind was quite wild in the morning so launches were delayed until Rob felt it was worth a Met flight, those who launched later when things had calmed somewhat had a ridge day which eventually produced showers (about the time that I fell out of the sky at Vyrnwy!). A mixed day, definitely wavey and a good example of the problems of a high inversion, approx 5000′ feet today, much easier at 3500′. The Sounding, Rasp and the synoptic all say WAVE!!!. If it looks like a duck, etc, etc Shoot it and eat duck. A fantastic night, yet again thanks to Denise for organising the lighting and the setup and the kitchen who laid on a wonderful supper. The social side of the club is one of our great assets so if you could help in any way then please do let me know. From the 1st of September there is a new process regarding imported gliders so we are now learning, with our colleagues at the CAA, how to expedite this as quickly as possible. EASA Pilot Licence Conversion. The CAA has reported that the outcome of the recent EASA Committee Meeting in Brussels, at which the UK Government was represented, has resulted in constructive progress on a number of important matters affecting the GA Community. The Committee voted positively on extending the Aircrew Regulation opt-out date for sailplane and balloon pilots. The BGA pilot licence conversion guidance has been updated to reflect the revised date by which pilots of EASA sailplanes must hold an EASA FCL SPL or LAPL(S), ie 8th April 2020. Thank you to each of the members who turned up on Wednesday morning to help with the road repair works. Everyone thoroughly enjoyed a morning of work and witty banter in glorious autumn sunshine and sustained by the free tea and biscuits, we were able to make tremendous progress. Most of the potholes have now been filled and so the road is serviceable again. The next phase will be to improve the drainage. Watch this space for news of when this will happen and if you are able to spare an hour or two to help out, please add your name to the list on the notice board. The team of Howard Bradley, Steve Foster, Martin McCurdie, Richard Bennett, Clive Crocker, the Chair all ably led by Tim Mason made great progress. There is a prize for naming the hard worker who managed to grab the correct end of the shovel in the photo below. The list is now full, please ensure you have paid Faye the deposit to avoid disappointment! November 25 will be the members evening when the committee will present our strategy for the next 5 years and invite your input and approval. I will provide more information next week but the committee are hard at work preparing facts and figures as well as presentations for you. 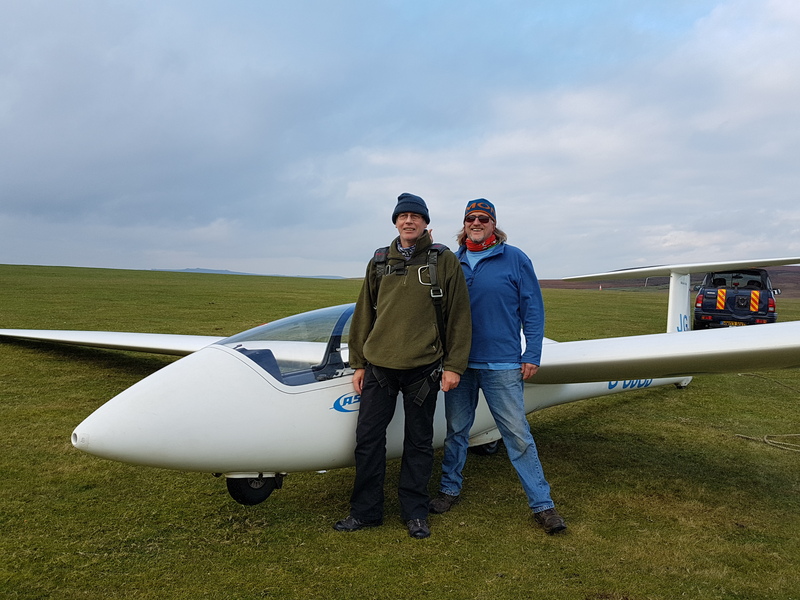 A rare benign winter southerly with enough headroom to launch gave the ideal opportunity for Nick to complete some final cablebreak checks and get his first solo flights. Steve Rudge also managed to clock up more solos and will soon pass that first milestone of being off daily checks (weather permitting). Owen Elias had his first experience of a real cable break. He has just started flying the launch and it failed only a few seconds after I gave him control! Nearly Four Firsts For Friday!!!! K23 – We are obtaining the C of A, then we can do the ARC so fingers crossed it should be in action in the next couple of weeks. Incident Reporting – It is very important that all pilots wishing to fly at the Mynd read the enclosed reminder from the CFI about what constitutes an incident. In fact it’s so important, that we will be sharing this every few weeks as a handy reminder of what to do, should you witness or be involved with an incident (however big or small). Click here to read it. Howard Bradley will lead the team and we intend to work between 10:00hrs and 13:00hrs on each day. If you are coming along to help out, please be at the club by 09:30 ready for a prompt start. As the saying goes, “Many hands make light work”, so if you haven’t yet put your name forward but find that you are able to spare a few hours on any of the above dates, please add your name to the list in the clubhouse or let Martin in the office know. Once again we are able to offer a first aid course to interested parties (see the poster below). Let Mark Rogers know directly if you wish to attend. The list is now full, please ensure you have paid Fay the deposit to avoid disappointment! Members’ evening – November 25 will be the members evening when the committee will present our strategy for the next 5 years and invite your input and approval.